Two of the jewellery industry’s leading trade fairs are set to open in Hong Kong in late February to early March. 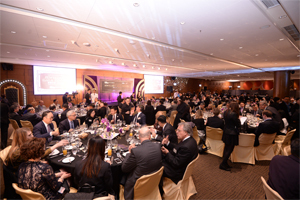 Organised by the Hong Kong Trade Development Council (HKTDC), the 4th Hong Kong International Diamond, Gem & Pearl Show will take place from 28 February to 4 March at the Asia World-Expo, while the 34th Hong Kong International Jewellery Show will open from 2 to 6 March at the Hong Kong Convention & Exhibition Centre. India is today the largest exporter in the world of Pearls, Precious & Semi-Precious Stones to Hong Kong and second largest exporter of fine jewellery to Hong Kong. Hong Kong’s imports of fine jewellery from India had doubled from 2013 to 2016. Rajesh Bhagat, India Consultant - HKTDC, highlighted opportunities for Indian companies offered by HKTDC during a press luncheon in Mumbai today. Mr Bhagat underscored the robust bilateral trade relations between Hong Kong and India, adding the twin jewellery shows created a good platform to boost business. “India and Hong Kong have a long and close business relationship. While India will continue to take the lead in regional economic growth, the HKTDC can act as an information and market intelligence hub for Indian enterprises to expand market,” said Mr Bhagat. In Hong Kong, the HKTDC organises more than 30 fairs annually, forming 11 largest marketplaces of their kind in Asia, with electronics, jewellery, gifts, lighting and watches & clocks being the largest of their kind in the world. Given the strong gems and jewellery business in India, the Diamond, Gem & Pearl Show and Jewellery Show provide an ideal platform for Indian traders in jewellery field. The two shows will welcome more than 4,380 exhibitors from over 50 countries and regions, forming the world’s largest jewellery marketplace. About 180 Indian companies such as Beads Paradise and Gold Star will join. The Gem & Jewellery Export Promotion Council from India will continue to set up group pavilions. Other pavilions will come from the Chinese mainland, Japan, Korea, Tanzania, the UK, France, Germany, Italy, Spain, the US, Peru, Columbia, Brazil and so on. The Diamond, Gem & Pearl Show will focus in jewellery raw materials such as loose diamonds, precious stones, semi-precious stones and pearls. Well-known exhibitors include Paul Wild from Germany and Hong Kong’s Novel Collection Ltd, Man Sang Jewellery (Hong Kong) Ltd and Yee On Gems & Jewellery Factory Company Ltd. Several dedicated zones are set up for specific jewellery raw materials, including Hall of Fine Diamonds for quality diamonds; Treasures of Nature for precious gemstones; Treasures of Ocean for exquisite pearls; and Rough Stones & Minerals zone for unpolished and uncut precious stones. The Jewellery Show will feature a wide range of finished fine jewellery. There will be a number of themed zones with the prominent Hall of Fame bringing more than 30 internationally acclaimed jewellery brands including Roberto Coin s.p.a. and Piero Milano Jewellery from Italy, Pranda Jewelry Public Co., Ltd. from Thailand, and Hong Kong’s Lady Heart Collections Ltd and Unrounds (HK) Limited. Hall of Extraordinary will house the most prestigious jewellery collections including Crivelli s.r.l. from Italy, Thomas Faerber SA from Switzerland, and Hong Kong’s Dehres, On Tung Company and Karen Suen Fine Jewellery Limited. Other zones will showcase various prestigious collections, jewellery craftsmanship, jade pieces, decorative items and machinery. The biannual International Jewellery Design Excellence Award (IJDE) is the Oscars of the jewellery design industry with an aim to recognise outstanding jewellery designers and facilitate information exchange in design, professionalism and craftsmanship. The award gathers the champions of various jewellery design competitions worldwide to run for the champion of the champions. This year, 165 entries from 27 countries and regions have been received, of which 13 entries are from India. Award presentation ceremony will be held on the first day of the show (2 March) and winning entries will be on display at the show. The shows will present a host of activities such as jewellery parades, seminars, forums and networking events that provide industry players with market insights and the latest intelligence.